The 25th Anniversary We the People National Finals was a great success! Nearly 1,000 parents and visitors attended the national finals. The following information will help you better understand and enjoy the national finals. The funding for the We the People national civic education program was cut in fiscal year 2011 along with thousands of other programs in the federal budget. Additionally, in the current 2012 fiscal year no funds were appropriated for civic education in any form. The We the People programs had been funded since 1987 first by the Commission on the Bicentennial of the U.S. Constitution under the leadership for the late Chief Justice Warren E. Burger until 1992 and through 2011 by the U.S. Department of Education under the Education for Democracy Act (Elementary and Secondary Education Act sections, 2341-2346). The loss of funding is largely due to the ban on earmarks in Congress. Until 2011 the We the People program was not categorized as an earmark because it was supported as a result of the regular authorizations and appropriations processes that directed the U.S. Department of Education to fund the Center for Civic Education to administer the program. The definition of "earmark" was changed a few years ago to include any funding Congress directed to a non-federal agency. The unintended consequence of this new definition resulted in the Center's programs and many other very effective programs to lose their federal funding. To conclude, the We the People program was not cut on the basis of the merits of the program. The program has been validated as an instructional success by independent research and evaluations and it has been among the most effective programs supported by the federal government. This has been well recognized since its inception. The program continues to enjoy strong bipartisan support in Congress and many members are seeking ways to restore its funding. If you meet with your member of Congress or a member from their staff please express your support for the We the People program and convey the impact it has had on your child. Urge their support in finding an alternative source of funding so national programs like We the People will be able to continue their effective and equitable impact throughout the nation. Visitors must register at the Center’s information desk each day. Visitors will be issued a name or state badge that should be worn at all times during competition events. Your name or state badge ensures your access to hearing rooms. Visitors without name badges will not be admitted into the hearing rooms. The hearings will take place in the George W. Johnson Center and Innovation Hall. Because the hearing rooms are limited in size the number of open seats depends on the class size and number of parents and visitors. Every effort will be made to ensure that parents and visitors who have come to see a particular student testify will be seated in the room during that student’s unit hearing. Parents and visitors may stand in the back of the room unless otherwise directed due to fire codes and at the discretion of the teacher, room supervisor, or Center staff. As usual, classes that have a large number of parents and visitors may have to devise rotation schedule. To ensure that the hearings are not interrupted, parents and visitors will be admitted to the hearing room at appropriate break times (between units) and after the judges have left the room. To ensure fairness anyone affiliated with a competing class (teachers, coaches, students, chaperons, parents, friends, relatives, etc.) may not enter the hearing room of any other competing class. Once a class hearing is completed, floor supervisors and Center staff will help direct classes and visitors exit in a timely fashion. If you are driving to campus, note that most GPS devices only recognize the 4400 University Drive address for George Mason University. Once on campus, you will need to follow the signs or a campus map. 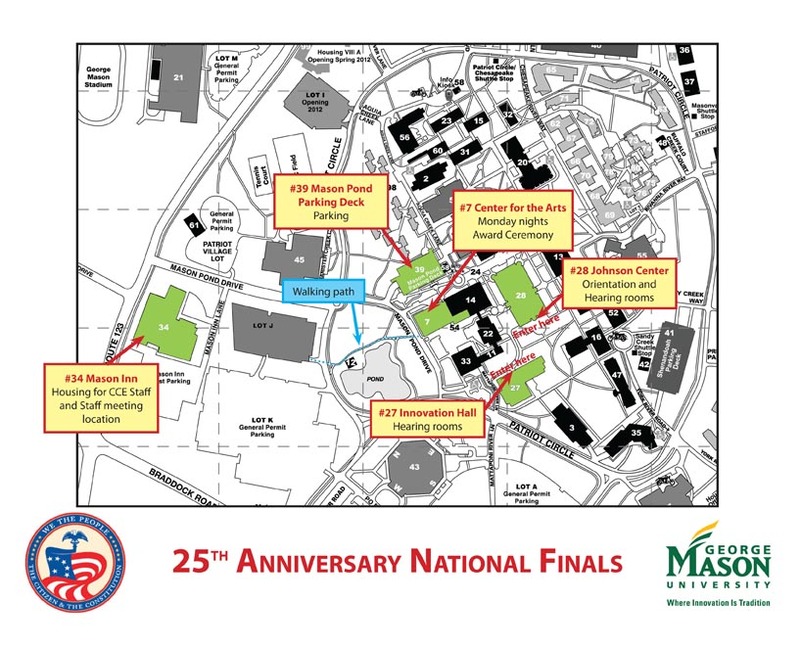 Saturday and Sunday commuters to the competition (George W. Johnson Center on the George Mason University–Fairfax campus) may park for free in Lot K. The walk from Lot K to the Johnson Center is approximately twenty minutes. If closer parking is needed, the Mason Pond Parking Deck will have limited availability for a fee of $3/hour ($14/day max) on Saturday and $7/day on Sunday. The closest Metrorail stop to George Mason University is the Vienna Orange Line metro stop. On Saturday and Sunday, there is no free shuttle from the stop to campus, so taxi service is the only option. Everyone is welcome to attend any of the hearings on Capitol Hill. However, competing classes and people affiliated with those classes may only attend their hearings. In addition, classes competing during the afternoon and people affiliated with those classes may not attend any morning hearing. Because the hearing rooms on Capitol Hill are substantially larger visitors may be admitted to a hearing room after a hearing is underway at the discretion of the room supervisor. A Room Supervisor will be stationed outside the hearing room to monitor admittance. The Student Orientation will he held in the George W. Johnson Center. On the Saturday and Sunday there will be a half hour briefing for all classes before the hearings begin. Robert Leming, Director of the We the People Programs and Mark Molli, Director of Governmental Relations will officially welcome students, teachers, parents, and visitors to the 25th Anniversary We the People National Finals and address the students about important matters concerning the competition. Upon arrival floor supervisors and Center staff will direct students to the Orientation room. On Saturday the briefing will take place in the Cinema. Parents and visitors will be asked to wait outside because of the size. On Sunday the briefing will be held in Dewberry Hall. Parents and visitors are welcome. 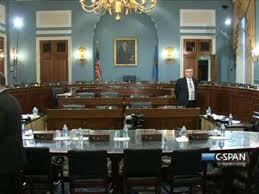 At the end of the briefing, floor supervisors and Center staff will direct classes to their hearing rooms. Once all classes have been dismissed, parents and visitors will be directed to the hearing rooms. The Awards Ceremony will take place at the Center for the Arts Concert Hall on the campus of George Mason University. In past years the Awards Ceremony could only accommodate students, teachers, judges, coordinators, and Center Staff because of space. This year is no different. We are pleased that so many parents are attending the competition, in fact, three times the number that attended in past years. Because of the large number of parents and visitors we will, as in past years, not be able to accommodate parents and visitors at the Awards Ceremony. The ceremony is the culminating event of the 25th Anniversary We the People National Finals. This is the time to celebrate the accomplishments of all of the students and teachers participating in the national finals. Approximately 1,500 students, teachers, judges, volunteers, Center for Civic Education staff, and special guests will be in attendance. Fifty-six recognition awards will be given to teachers. In addition, twenty-two class awards will be given, including six unit awards, five regional awards, a special George Mason question award, and tenth- through first-place awards.